New Jersey establishment Republican Governor Chris Christie’s problems with the flap over the closure of two access lanes to the heavily traveled George Washington Bridge between New Jersey and Manhattan, in apparent political retaliation against a mayor who refused to endorse him for re-election, has been a boon for the Republican establishment’s Great White Hope – former Florida Governor Jeb Bush. According to our friends at NewsMax, doubts about Christie’s prospects as a potential presidential candidate have begun creeping into the minds of donors in key states, according to some GOP fundraisers. Our old friend Ann Herberger, a national Republican fundraiser based in Florida, said Christie's robust persona and blunt style can pack a room. Some donors, however, have expressed reservations about his future because of the “Bridgegate” scandal. "There are influential donors who are giving him a second and third look," Herberger said of Christie. "Where they would have been 'this is the guy' two months ago, I think a lot of people are giving him a second look and keeping their powder dry." But that’s kind of the point, isn’t it? In establishment Republican presidential politics sewing-up the early support of major donors is a key part of the typical establishment Republican strategy of running a content-free campaign and carpet bombing your opponents into oblivion with negative ads. If the major donors of the Republican establishment are keeping their powder dry and not making early commitments to Christie that advantages one potential candidate more than any of the others: Jeb Bush. 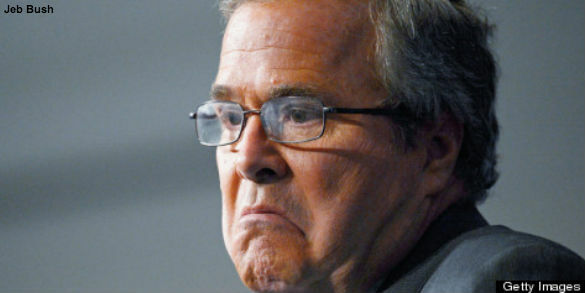 No one else in America, save Hillary Clinton, starts the 2016 political season with a larger Rolodex of Washington insider supporters than does Jeb Bush. In addition to supporting all of the major policy goals of the Republican establishment from Common Core to amnesty for illegal aliens, a Bush candidacy also holds out the hope of millions of dollars in consulting business and lucrative lobbying contracts for a small but powerful coterie of Bush family supporters and acolytes. A Jeb Bush nomination and election as President would ensure that the Republican establishment stays in power for at least another decade, and a Bush nomination would also ensure that, whether Jeb or the Democrat wins, Big Government will prevail. Submitted by sir_aslan on Tue, 02/11/2014 - 15:43. It insures that RINO'S will remain in power to grease the paws of the Global community and Big Corporations! It insures that IMMIGRATION will be a pivotal part of the New World Order as Corpratism replaces "Free Enterprise" and cheap labor replaces a living wage for American workers. Jeb Bush....the darling of Republican Progressives ! !